Malaysian retail investors used to have limited access to global markets and investing in foreign stocks involved high transaction fees. However, the process is becoming easier and cheaper as more foreign brokerage firms enter the region to compete with local players by offering competitive rates and diverse products. US brokerage giant Charles Schwab, for instance, opened an office in Singapore in November last year, giving Malaysian, Singaporean and Thai investors direct access to the US market and zero trade commissions for its wide range of exchange-traded funds (ETFs.) The previous year, Singapore-based iFast Financial Pte Ltd, which operates Fundsupermart.com, launched online platform FSMOne to offer US and Hong Kong-listed securities to investors, including Malaysians. Other online brokerage services that Malaysians have access to include those offered by US-based firms Interactive Brokers (IB) and TD Ameritrade. According to several investors and a financial planner who spoke to Personal Wealth, cost is still a huge concern for Malaysians who want to diversify into foreign stocks. 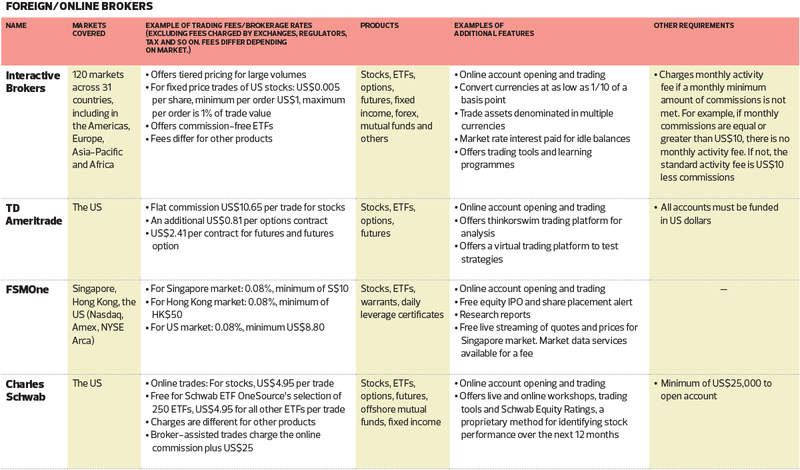 The entry of more foreign brokerage firms could potentially solve this pain point as many of them operate entirely online, charge lower fees and offer access to a wider range of markets and a large variety of products. “Right now, the biggest hurdle would be the huge fees involved. However, brokers such as TD Ameritrade are gradually reducing their fees, which should see more Malaysians investing abroad,” says Lee Han-Ming, a certified financial planner and operator of the Dividend Magic blog. Some Malaysians travel to Singapore just to open a bank account and invest in stocks there, observes Rusmin Ang, equity investor and co-founder of investment website The Fifth Person. But more convenient and affordable options offered by foreign and online players could change that in the near future. “It is only a matter of time before these foreign brokerage firms come in and that is because of the internet. Things are getting cheaper and people are better informed. Over time, you will see the fees come down as more foreign players come in,” says Ang. Meanwhile, the widespread adoption of mobile trading, emergence of robo-advisors or algorithm-based investment platforms and availability of stock trading courses for the public will likely increase the demand for affordable ways to trade foreign stocks, observes Bryan Zeng, general manager of FA Advisory Sdn Bhd. Ultimately, which brokerage firm one uses to invest in foreign stocks will depend on one’s investment goals. Each firm has its own strengths and weaknesses and investors will have to do their own research to find out which brokerage is suitable for them. Among the criteria investors should consider are the strengths of the brokers, the services and support offered, the fees and exchange rates as well as market accessibility, say investors and financial planners. Other details they should pay attention to include the minimum amount required to open an account and the tax implications. For instance, the US has a withholding tax of 30% for dividends while Thailand’s is 10% to 15%. “It is very important to know that brokers have failed before. If you are caught with a broker who abuses client funds, it can be very messy,” says Chua Zhu Lian, a private investor and managing partner of Vision Group, a group of companies involved in investments, advisory and education. There are usually trading fees and a minimum amount to open an account as well as varying exchange rates. Foreign and online brokers generally charge lower fees than local investment banks, but this may be more relevant to active traders because the transaction fees for investors who buy infrequently may not be that substantial, Chua observes. “My estimation is that a local broker is 30% to 40% more expensive than a foreign one. If you are a trader, it definitely affects you a lot. But if you are an investor, I guess sometimes you may not want to go through all the documentation to open an account with a foreign broker and deal with foreign currency. It would be easier to deal with a local broker if your account is here. That is why they charge a premium for that convenience,” he says. For example, to invest in Singaporean stocks from Malaysia, the trading fee or commission of several local investment banks ranges from 0.4% to 0.6% for trades below RM100,000, whereas brokerage firms such as IB only charge 0.08%, according to Ang. Brokers also charge a minimum fee. “Let’s say you buy RM1,000 and the 0.4% fee is about RM4. So, they charge you a minimum fee of S$40, for example, and that becomes a 4% fee,” he says. Compared with a Malaysian bank that charges a minimum fee of S$40 to trade Singaporean stocks, IB’s minimum fee is S$2.50, he adds. 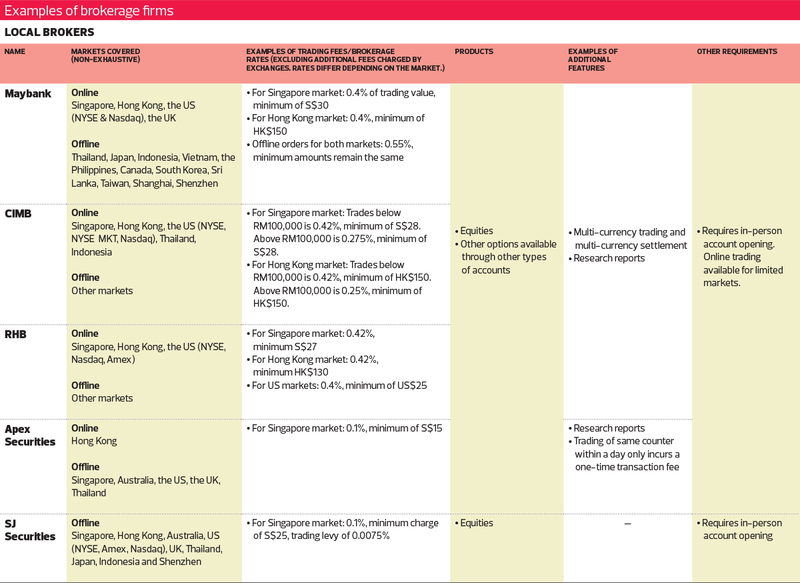 According to Zeng, local brokers may charge a minimum fee of US$20 to US$40 to trade US stocks while foreign brokers can go as low as US$1. Other criteria investors should pay attention to are whether interest is paid for idle cash in the brokerage account and if any tax is applicable to foreign investors. “[The choice] really depends on the investor or trader’s objectives and trading capital. Usually, there is a scale where the fee goes down as the trading capital increases,” he says. The types of products and services offered by brokerage firms are important to consider. Some firms offer research reports, trading and charting software, live pricing and order types — sometimes at additional cost. There are also brokerage firms that offer not only access to stocks and listed ETFs but also bonds, forex, options and futures trading. Some specialise in instruments such as contracts for difference and are able to provide better spreads. Local brokers may have a leg up when it comes to offering support. “Having a local broker helps a lot when you can just call him. But with lower fees, it is sometimes hard to get customer service,” says Ang. But dealing with a foreign broker can still be inconvenient. For instance, opening an account tends to be a tedious process. It took Ang more than a month to open an IB account, which required a lot of verification. “I think the delays were caused by a lack of communication as there weren’t any email or SMS notifications on the progress of the account opening after I submitted my application. It was only two weeks later that I found out that I needed to check the application status myself,” he says. Ang has been using IB to invest with his partners in Malaysia, Thailand, Indonesia, Australia and Hong Kong. He plans to trade Japanese stocks next. Ang keeps a multi-currency account with IB so he does not have to keep converting currencies every time he trades. “Their forex rate is by far the best,” he says. Zeng also uses IB for its low trading cost, availability of trading tools and access to various markets and instruments all on one platform. For more mature investors who intend to trade international stocks, an online global broker would make more sense, he says. Ang agrees. “Fee-wise, it makes more sense to go for foreign brokers over the long term. For someone who is just starting out and has a five-figure portfolio, he can stick to local brokers unless the portfolio grows to six or seven figures and onwards,” he says. As Ang is a mid to long-term investor, he usually advises customers to focus on long-term stocks and not to be fixated on brokerage fees, which are an important consideration for frequent traders. 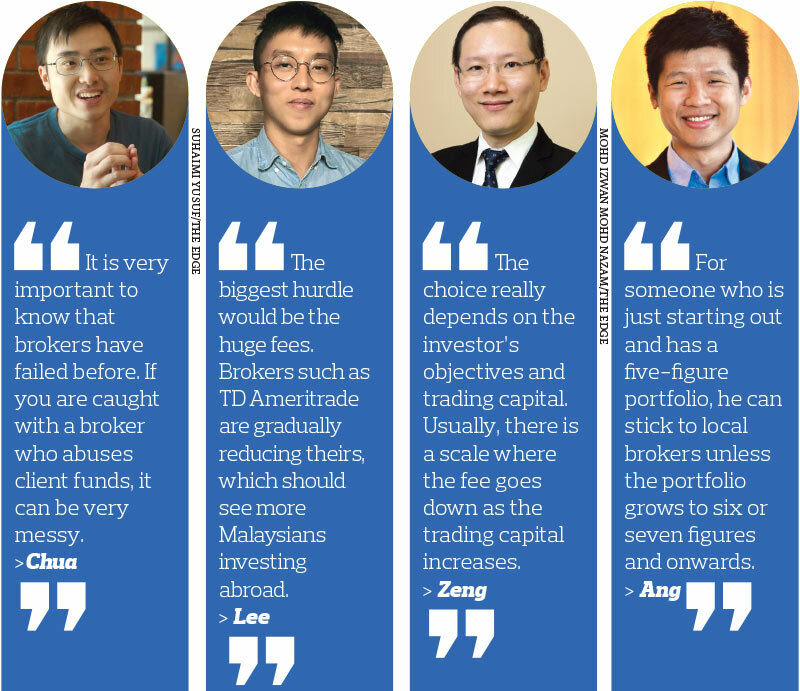 Both Chua and Lee are also long-term investors so they do not have frequent transactions. For that reason, they are currently using brokers with local investment banks. “I focus on services and support strength. I also prefer brokers who can help connect me with companies that can provide superior research and other services,” says Chua, who focuses mainly on Asean, China and Hong Kong markets. Lee uses a local broker to invest in stocks listed in the US. “For example, I have invested in the Vanguard S&P 500, which mirrors the top 500 companies on the New York Stock Exchange. I view trading internationally the same as we do locally. The most crucial aspect would be the fees and exchange rates. Because I invest for the very long term, I do not really mind if the broker takes three days or a week to complete my orders,” he says.